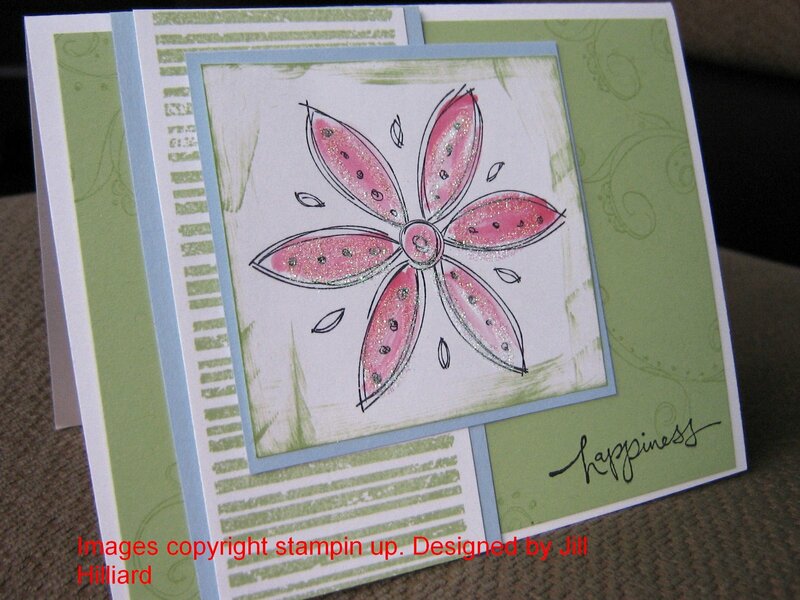 This Doodle flower was a last minute design for my Spring card camp last night. I have used this Doodle set 1 time! (yup, just once) Many love it, I am not so sure. So, I felt if my friends came over and made a card with it, they could help justify the stamp set purchase! The backround sampler is another set that does not see ink too much either. Since the backrounds are not retiring, I will be trying to use them more as well. Stamp sets used are Doodle this, warm words, and the Backround sampler. Certainly celery and black ink and rose red. Celery, bashful blue and whisper white cards stock. Can you see the glitter all over the flower? I used the zig pen and glitter. The flower was colored with the water brush and the rose red ink. WOW- it looks really sparkly in real life! all the ladies wore a hefty dose of glitter home last night… it was everywhere! Great layout! Thanks for sharing it with us. Gorgeous Card! I love the colors you've used…lovely!